– Is It Time Yet? 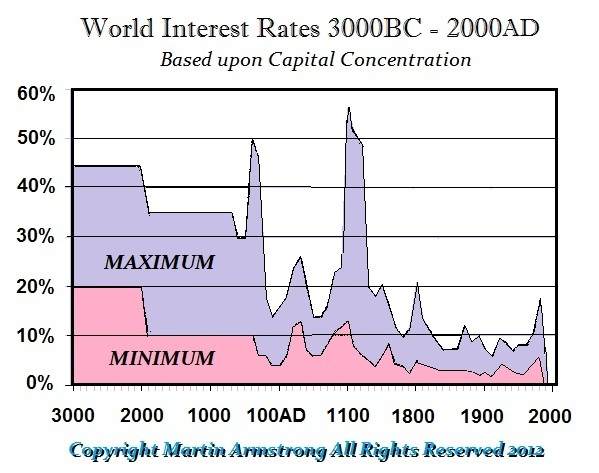 Martin Armstrong: "If there was ever any question that this is a bond bubble with a 5,000-year low in interest rates, the final bit of insanity just took place. Italy managed to sell its first 50-year bond last week as investors were betting that the European Central Bank might soon add ultra-long debt to its asset-purchase stimulus scheme. Draghi has said he would do whatever it takes to stimulate inflation. Hence, speculators are betting they can sell these 50-year Italian bonds to the ECB for a profit. The speculation was so great that about 16.5 billion euros in orders were received for a bond issue that was about 20% of that amount. They are not considering the risk that the upcoming referendum might overthrow Italy’s prime minister. This is speculation gone completely mad. These insane speculators have already bought 50-year bonds from Belgium, France, and Spain as well. Many of these same speculators have also signed up for Ireland’s 100-year bond in March."